Over time, the soil in lawns becomes compacted. This can be caused from a variety of factors, including regular wear and tear from kids and pets and any heavy construction equipment used for remodeling projects. Grass roots need air to breathe and space to grow. Compacted soil strangles and suffocates grass roots and makes it difficult for new grass to take root. Aeration will loosen up the compacted soil and free up space for grass to grow. Aerating is a great way to improve the health of your lawn, but overseeding is a natural addition to the process. The combination creates good seed-to-soil contact. Rather than just throwing seed on top of the lawn, aerating before seeding will allow the seed to fall into the holes for a better germination rate. Aerating before seeding also gives young grass seed space to grow. Aeration and overseeding make a great pair but adding compost topdressing takes it to the next level. Adding this step to the process protects the young grass seed by covering it with a layer of compost loaded with beneficial organic material. This also closes the holes created by the aerating step which provides even more seed-to-soil contact. This three-step process, coupled with proper watering techniques, is the best way to ensure maximum germination of grass seed. Aeration, overseeding, and topdressing in the second half of the lawn care season are key to improving the growing environment for your lawn. At Velvet Green, we always complete these three services in order described. Technically, this means we are “under-seeding” your lawn as we add the compost on top, but that means the seed is exactly where it needs to be to grow– in the soil, not on the soil. There is no arguing the fact that a thick healthy lawn is the absolute best defense against weeds and crabgrass. If you have thin or bare areas in your lawn, aeration, overseeding, and compost topdressing is an absolute must. For many years, professional golf course greens keepers have known that the secret to a beautiful, dense turf is to aerate their course two or three times each year to allow the healthy grass roots to thrive. 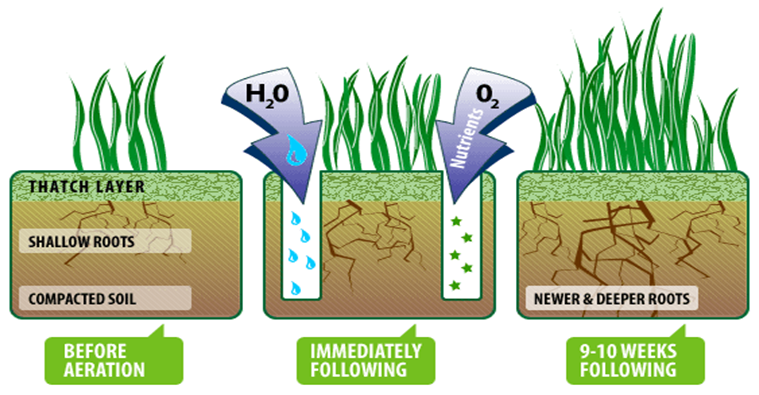 Aeration removes cores of soil from the lawn to allow for improved exchange of gasses between the soil and the atmosphere, improved water filtration, improved rooting, decreased soil density, and a site for seed germination. Aeration is performed during the fall months of the year after the heat and humidity of summer have broken. When overseeding, we use our Velvet Green Resilient Turf Mix. This proprietary grass seed mixture contains grass varieties that are lateral spreading and salt-, heat-, and drought-tolerant. This combination of grass seed will help lawns remain resilient through some of the harshest summer conditions in the future. Introducing new, improved cultivars of turfgrasses helps keep the lawn thick and healthy. Adding a thin layer of compost over the seed bed after aeration and seeding have been performed is like buying insurance on the work. It gives a light covering to the seed which protects it from wind and birds. It also insulates the seed and allows it to stay more moist from irrigation. Topdressing reduces lawn stresses, helps keep thatch under control and acts as a long term natural fertilizer.